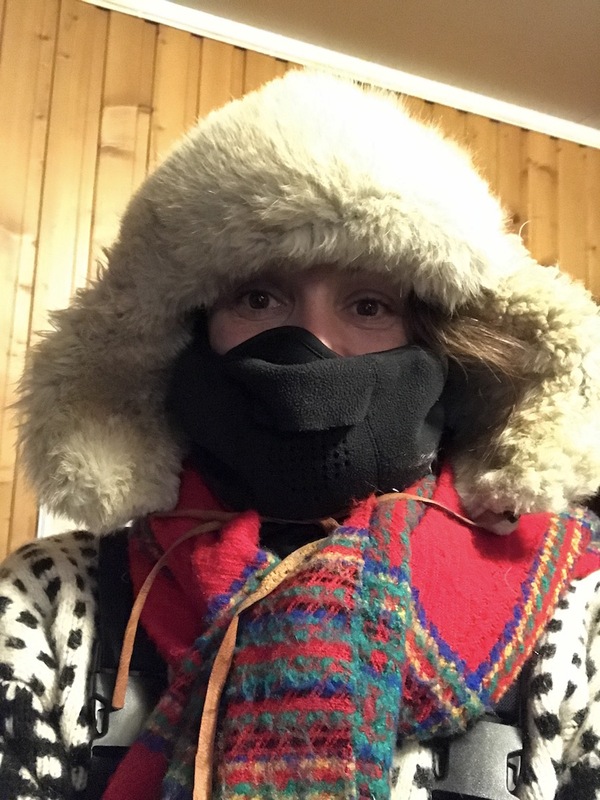 Layered in more clothing than I thought humanly possible, with not an inch of skin being shown for fear of frostbite, I hopped into the front seat of a sled being pulled by a snowmobile for an almost two hour expedition deep into the Arctic tundra. This ride, that immediately froze my goggles to the point of where there was zero percent visibility the entire time, would lead me to an experience that could never be erased from memory. 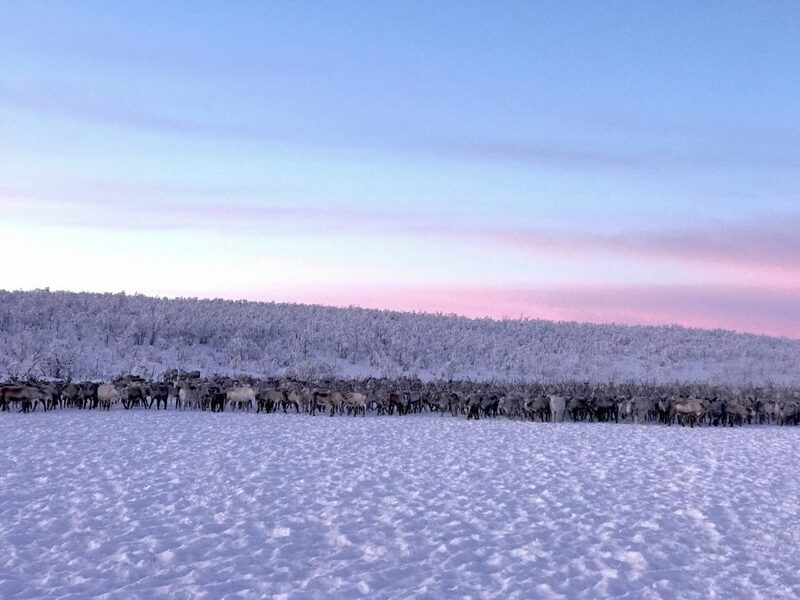 The next few days would be spent in negative twenty-five degree temperatures with a reindeer herder and his family—an authentic immersive home stay with an indigenous Norwegian Sámi family. The Sámi are indigenous people to the very north of Europe, in the arctic area of Sápmi, which spans the northern parts of Norway, Sweden, Finland and the Kola Peninsula of Russia. 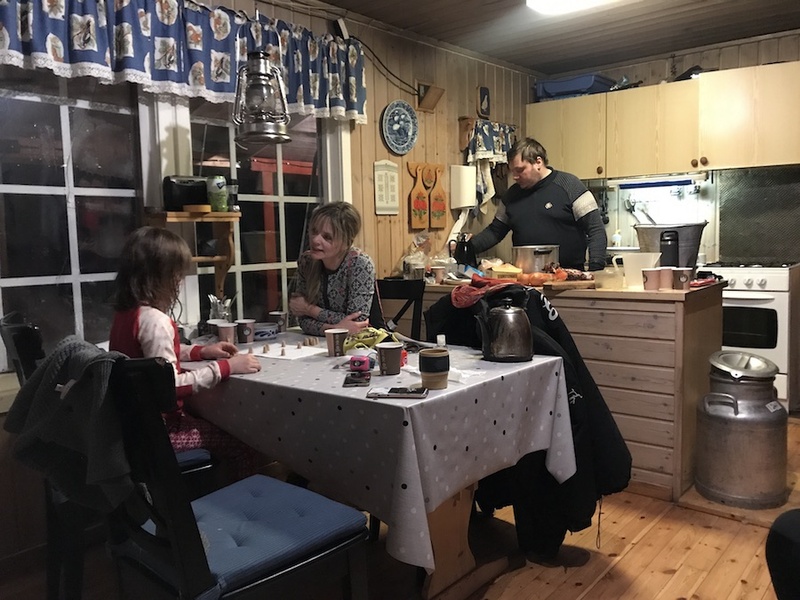 There are approximately 80,000 Sámi living in these four countries with a majority in Norway, and specifically in the Finnmark region where my homestay visit was. 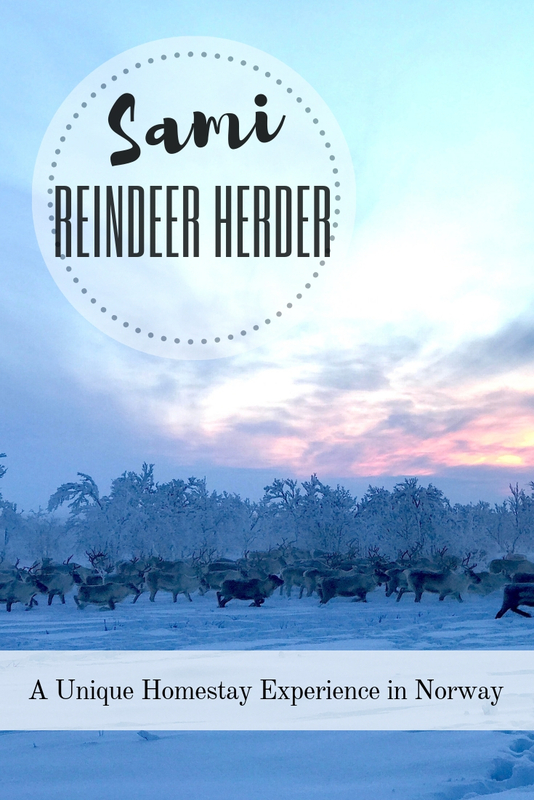 For many years, reindeer herding has been a popular way to earn a living amongst the Sámi through the selling of meat, milk and fur. 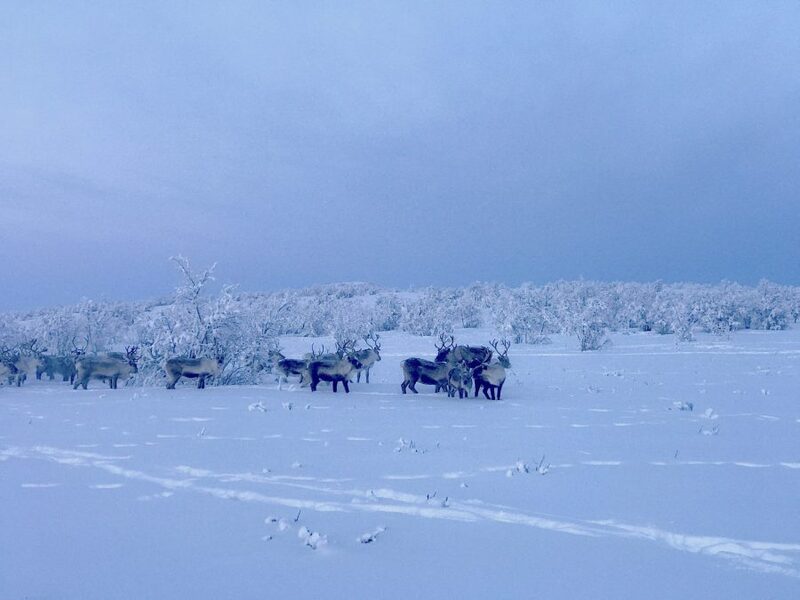 There are still an estimated 2,600 Norwegian Sámi reindeer herders, with a combined herd of approximately 200,000. 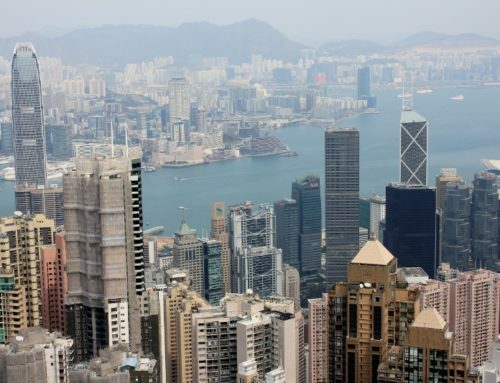 While the trade is still prominent some have moved away from the settlements and into bigger cities nearby. In earlier times, the Sámi people lived in sod huts and temporary seasonal dwellings. They set up these lavvu and goathi to protect themselves from harsh weather and high winds. Even when moved away from this part of their tradition, the tents are still a main part of their cultural heritage, though now being mainly used for camping during migration and smoking reindeer. 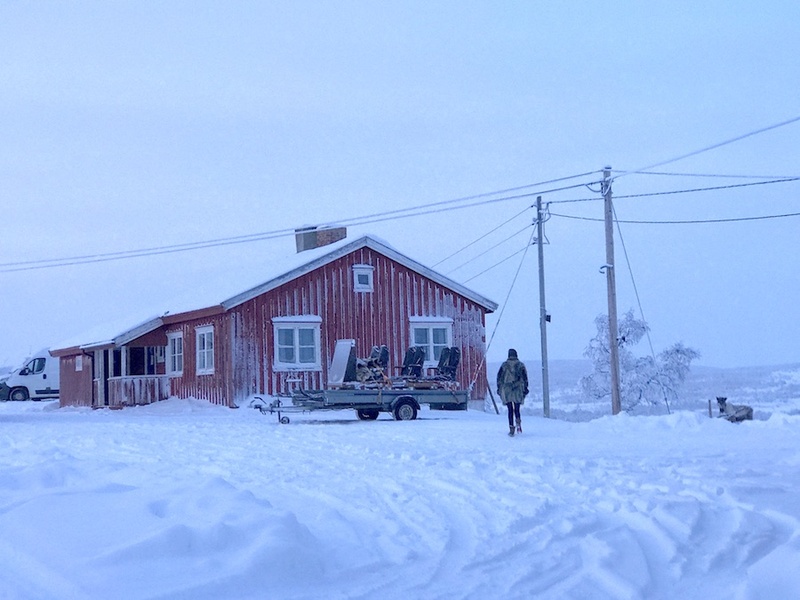 I didn’t know you could say ‘snow’ in hundreds of different ways until I met the Sámi family. I guess a part has something to do with being encircled by snow-capped mountains during the winter reindeer migration. It also goes to show how connected they are to their surroundings. The Sami regions actually have nine distinct languages that are closely related, but in Norway only three of these dialects are typically spoken. With that said, almost all Sámi in Norway are now bilingual (or trilingual), speaking Norwegian, English and a form of Sámi . Each language, or dialect, has a rich vocabulary with thousands of words dedicated to nature, animals, seasons, and environment (the reason why there’s so many versions of the word ‘snow’!). 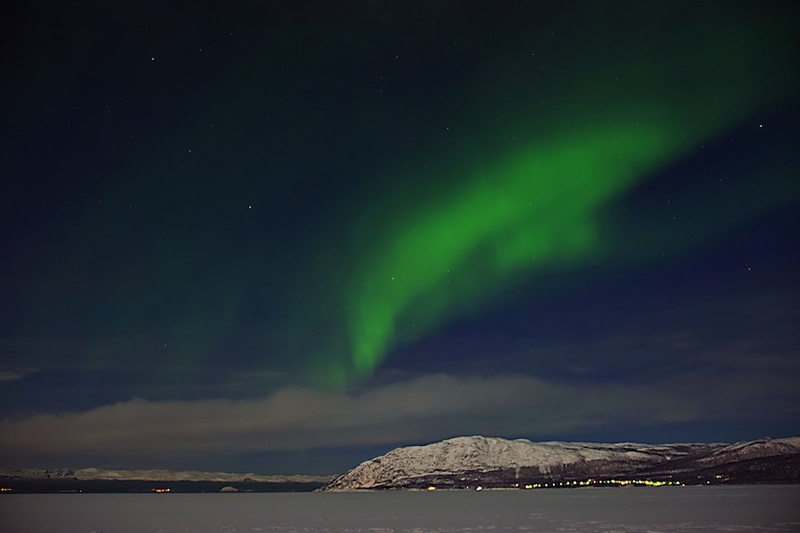 Unfortunately, the Sámi dialects are endangered in the coastal areas as more and more people are now using Norwegian as their primary language. 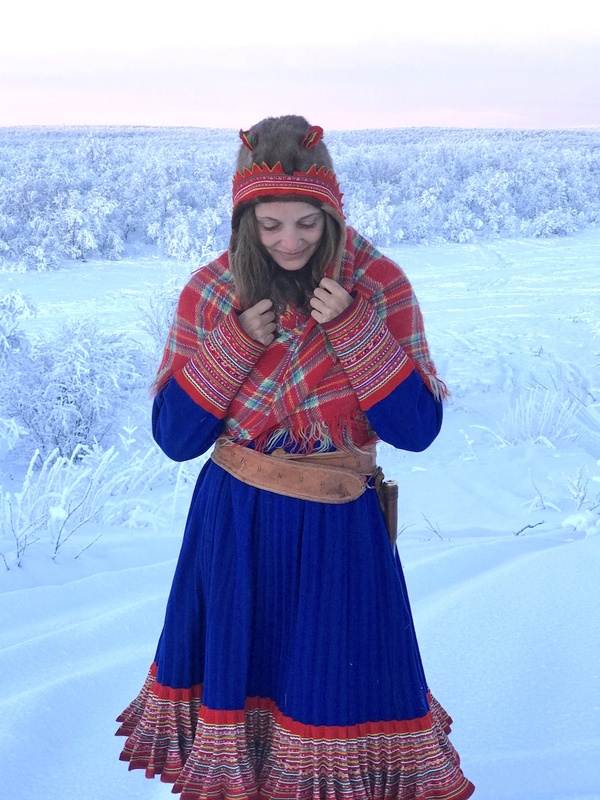 You will find Sámi people clad in bright blue and red attire made of reindeer skin (and more commonly in modern times made of silk, cotton, and wool). The traditional clothes are called gákti and while they are a visual treat, they speak a lot about their culture. 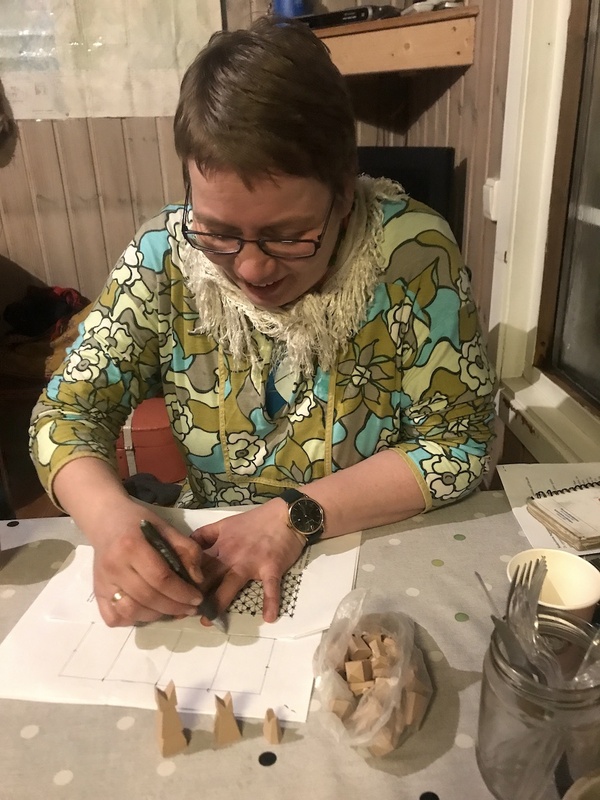 The colors, patterns, and the jewelry of the gákti can tell you a lot of things about a Sámi; such as which family they belong to, where they are from and whether they are married or single. 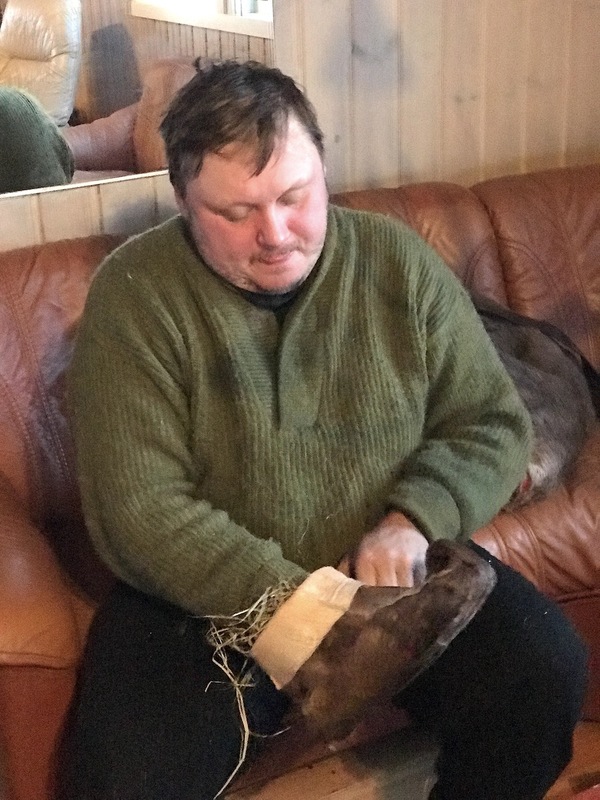 Their shoes are made from reindeer skin and then line with soft sedge grass for warmth (a technique I was happy to discover on day two!). While many urban Sámi have adopted western clothing, they do turn up in their traditional clothes during celebrations and festivals. The clothing is not meant to be cute fashion statement for visitors, it holds so much tradition and should be respected by anyone who wears it. That is why it was a true honor when Nils wife, Oddbjørg Hætta allowed me to borrow her gákti. 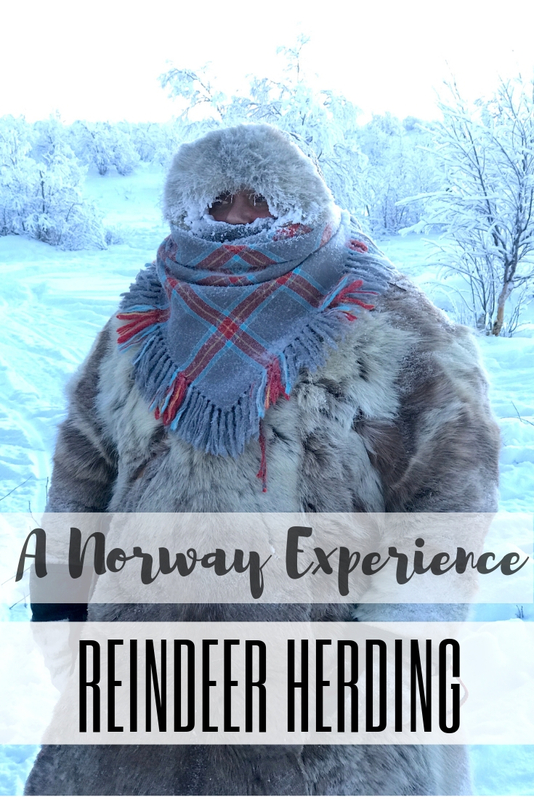 Though grateful for Visit Norway and Impact Travel Alliance to invite me to participate in such a unique experience, I am not going to lie, at first I was pretty darn skeptical about living off the grid with a reindeer herder and his family. No internet, minimal electricity, four hours of daylight and temperatures in the negative double digits? How will a girl who thinks 70 degrees is sweater-weather ever survive? 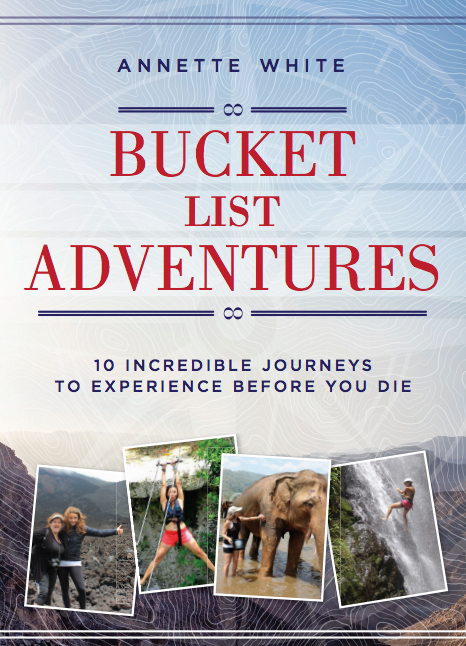 This travel experience, thoughtfully created by Visit Natives, would push the boundaries of my comfort zone. But, instead of saying yes to fear, I took a deep breath, packed two dozen toe warmers (literally!) and decided to face the challenge. 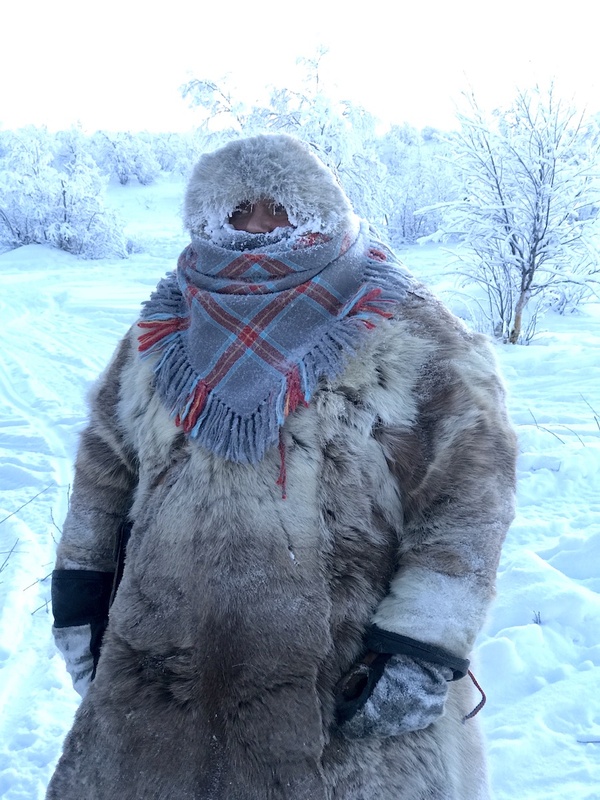 Nils Sara has been reindeer herding for 25 years, since he was only 16 years old. Every morning he wakes up in the wee hours to tend to the herd of 700 and spends the evenings chopping firewood, smoking meat and fetching water from the river. With this rigorous daily schedule he would go on to tell me, multiple times, that he had the best job in the world. That is passion. He says that he always manages to remember the good days and never the bad (what a great talent to have, right?). 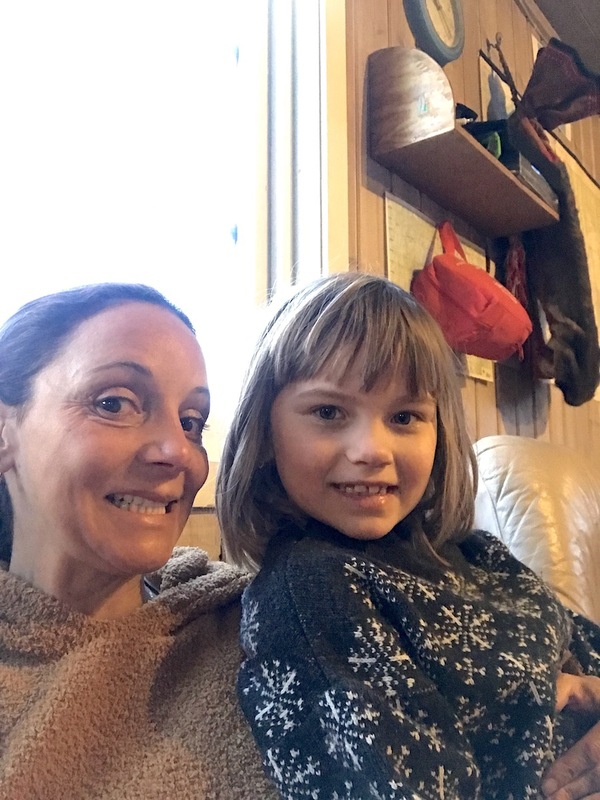 His wife, Oddbjørg Hætta Sara, is a school teacher and together they have 3 children: Marie, Mikkel and the youngest, Inga (pictured with me below). Nils also has two other children from a previous relationship, though we unfortunately did not get to meet them. 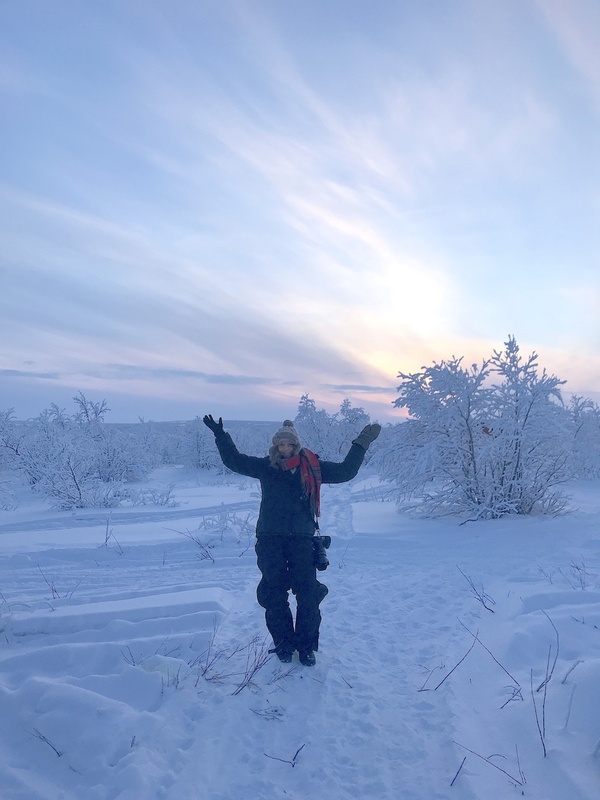 From the city center in Alta, it was about a two hour drive to a small reindeer herder’s communal house, a place to warm up and get a cup of coffee before the next leg of the trek deep into the Arctic tundra of Finnmark. This is also where you will get layered in as many clothes as physically possible (and then a layer on top of that! ), making sure that every bare inch of your body covered. Nils brought several large garbage bags into the room and dumped their contents in the middle of the floor. Though I already had snow pants and a jacket, I snagged another one of each to double up, plus an oversized wool sweater. 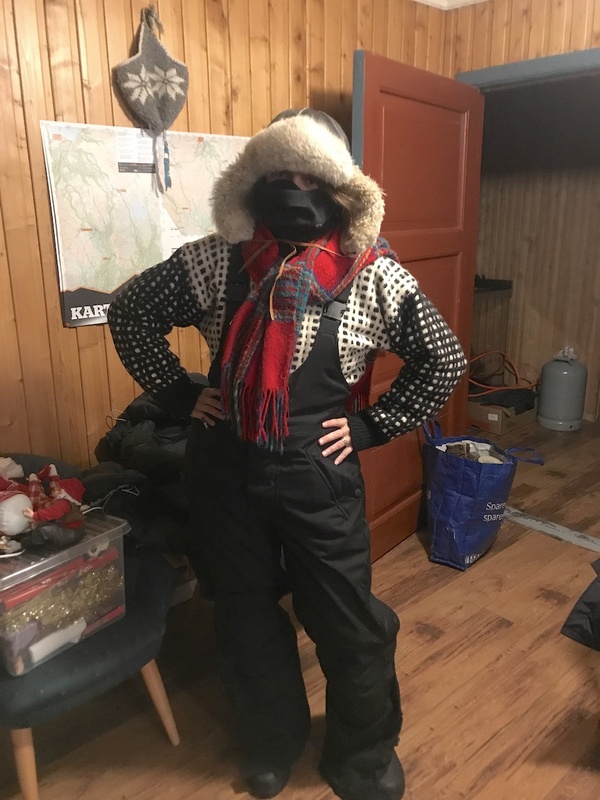 As I learned a few days before while dogsledding with Trasti & Trine, my own attire was no match for the Norway weather. To get to the family’s winter migration cabin, a six-passenger sleigh was pulled by a powerful snowmobile for about an hour an a half. To be honest, the ride was less than comfortable. My toe warmers were not doing their job, the goggles immediately froze up leaving me sightless and bending my legs to fit in the seat in four layers of bulky clothing was quite a challenge. But without this unique commute, where standard roads did not exist, the experience would have been entirely different. TIP: Even if you think you are layered enough, whatever gear they offer you…take it! Negative 25 degree weather, plus the windchill of the sled can be excruciatingly cold without the proper gear. There was a sense of relief to finally step off the sleigh and inside the cabin where the wood burning oven was already blazing. The cozy quarters had three tiny bedrooms, a small kitchen with dining area and a family room. There was also a ‘cold room’ which in the winter was used as the freezer—no electricity needed. With the season’s weather perishable items are just placed on the counter and stay frozen from the temperatures outside. Electricity was ran by a generator that needed to be filled with gas and cranked every morning, but one of the biggest challenges was that there was no running water. Water had to be fetched from the nearby river at least one time per day. 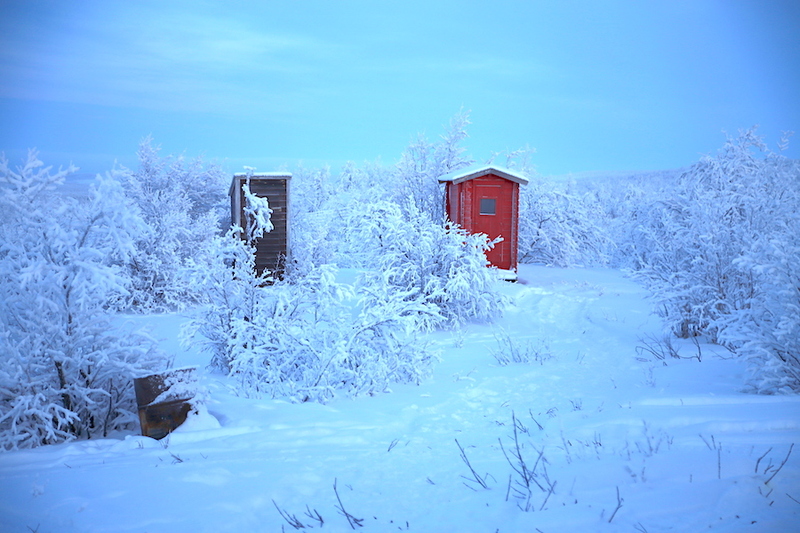 The bathrooms were two unheated outhouses, about 50 meters away from the main cabin. Getting to them almost always required getting dressed in full winter attire and a headlamp. Imagine having to pee in the middle of the night! In and outside the cabin, the guests were in charge of the daily chores. Some chopped wood while others cooked meals. Some fetched water and others fed reindeer. 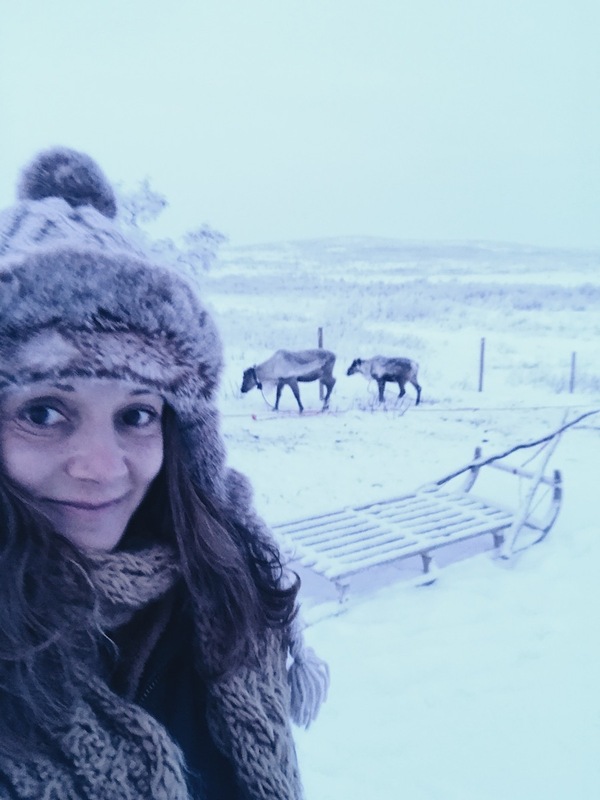 This was a hands-on immersive homestay experience—we were living the life of a reindeer herder. The biggest perk to the residence was the 360 degree view—the front and backyard were a winter wonderland, snow covered trees as far as the eye could see. 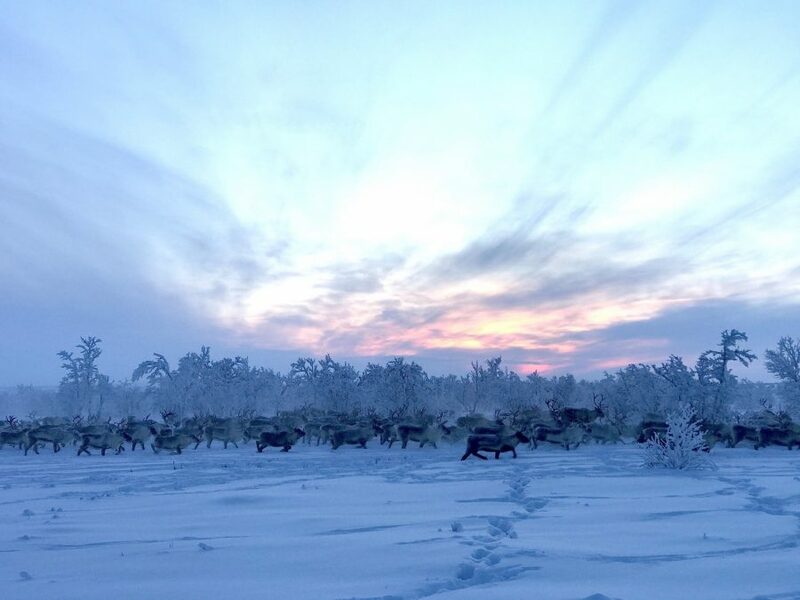 Nils and his family have about 700 reindeer, and tending to them is a beyond full-time job—it is a 365 day per year commitment with constant supervision. It is way more than just a career, it is a way of life. 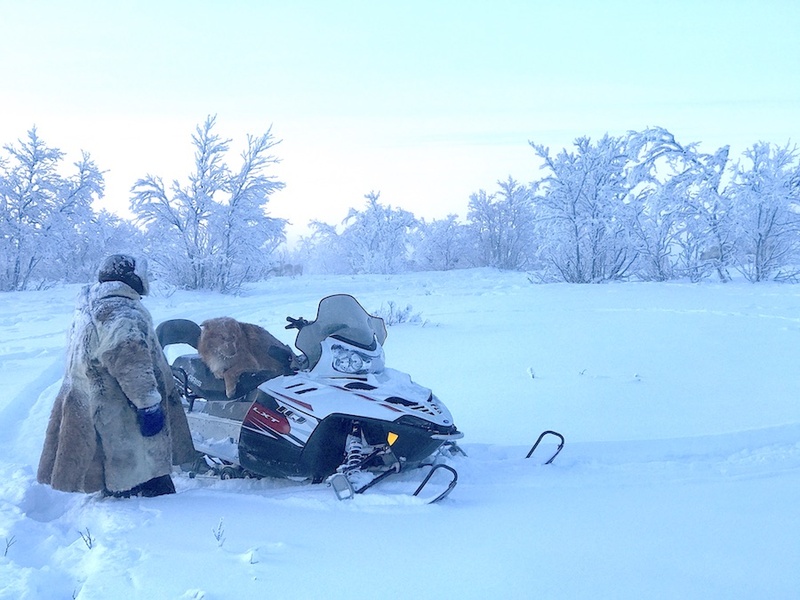 Though the Sami herders say they have eight seasons, each requiring a different task, no two seasons are the same and with the effects of climate change it is getting even more unpredictable. They are noticing warmer winters (even though it was -25 degrees Celsius when I was there!) and more of a fluctuation. So they are becoming more uncertain about their future. Though you can visit in every season, I was there to participate in the tasks of the winter migration, a time to move the herd between lichen-rich pastures so they can find enough to eat. During my visit, Nils was always the first to wake. He would put a couple of logs on the fire for those of us still sleeping. After breakfast he revved up the snowmobile and we headed out to inspect on the herd. On these checks he is always concerned about the wellbeing of the animals, making sure they we safe from predators, but there was more to it than that. We were also checking for strays that may have left the group, or joined. 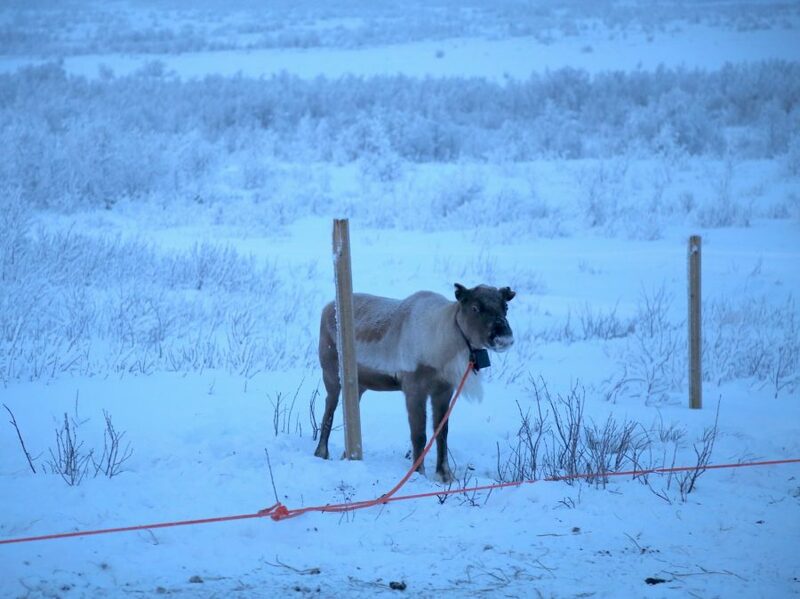 With so many herds nearby it was easy to lose or gain a reindeer every now and then, but determining which belonged to him was easy because each Sámi family has their own earmark. This earmarking is done to the calves during midsummer and it is a time when all the family heads to the mountains to participate. Interested in participating in the earmarking experience? 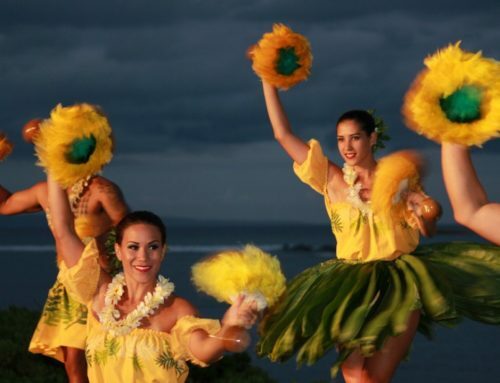 It is another homestay option that you can book through Visit Natives. After returning back to the cabin it was time to feed the two young reindeers that were separated from the the adults in order to be domesticated. With a little work and a couple weeks time, their jumpy personalities become more calm. They will then be ready to join the herd. For now, I simply scattered pellets at their feet and quickly departed so as not to alarm them. There was one more check on the herd in the evening before heading to the lavvu for the next reindeer-related chore, smoking some meat. The reindeer meat would hang down from the ceiling of the temporary tent, a few feet from the fire. It would catch the smoke and heat for the next five hours, until it was then ready to eat. 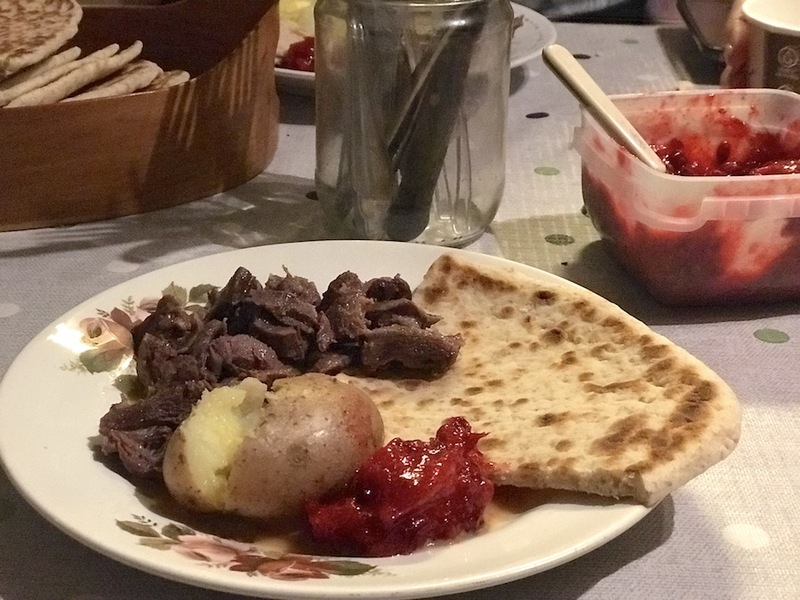 In a Sámi kitchen reindeer meat, fish, coffee, and wild berries are a common finding. 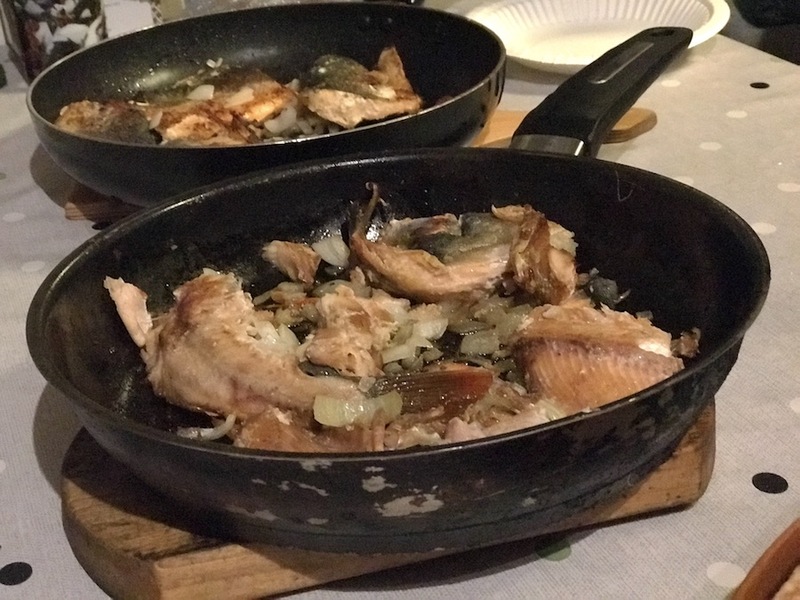 On my first night, we had a simple meal of fish sautéed in a pan with onions and served with Sámi bread. Dessert was slightly defrosted cloudberries, that were found earlier in the summer, and a couple dollops of vanilla yogurt. The next night was all about the reindeer that we had smoked previously in the lavvu. It was cut up into small pieces, boiled for about an hour and then served with a roasted potato and a side of lingonberries. 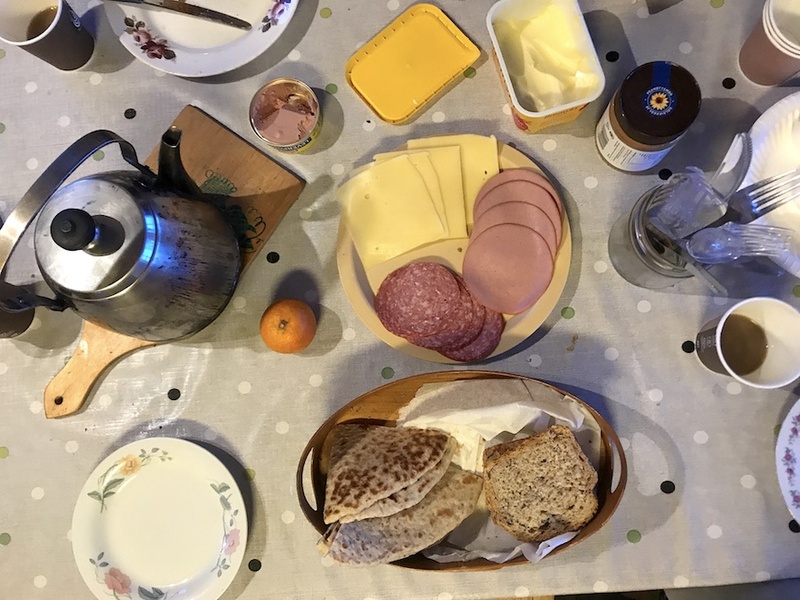 Breakfast was typically a selection of fresh breads baked by Oddbjørg, sliced meats and cheeses. A jar of peanut butter and a chocolate spread was also placed on the table for those who choose to slather it on their bread. The drinking water comes from the nearby river and has to be collected at least once a day. There was no need for boiling, it was pure and ready to drink. If you wanted coffee or tea, a large kettle of hot water was always on the wood burning stove. TIP: Bring an insulated water bottle. My Takeya bottle was impressive! Even in the coldest temperatures, it kept my tea warm for hours. I threw it in my suitcase last minute and it was a saving grace when we were out with the reindeer. 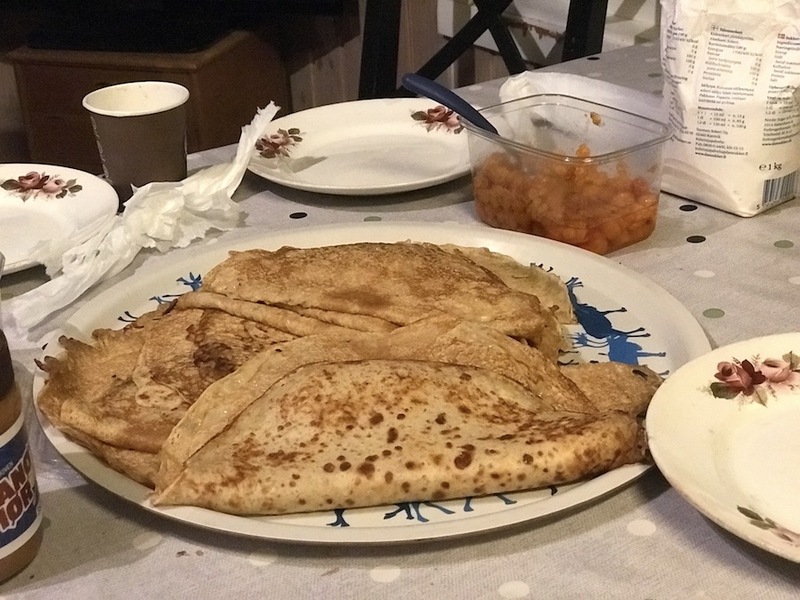 When the dishes were washed and other chores were done for the day, we went to the goahti, a more permanent dwelling that should not be confused with a lavvu which is more portable. The tent floor was lined with reindeer pelts and there we sipped on coffee while Nils honored us with the traditional Sámi song, a joik. The sound of joik comes from the sounds of nature, like from the noises of the blowing wind or running water. Typically a joik is made for a person and supposed to reflect their personality or the way you feel about that person. 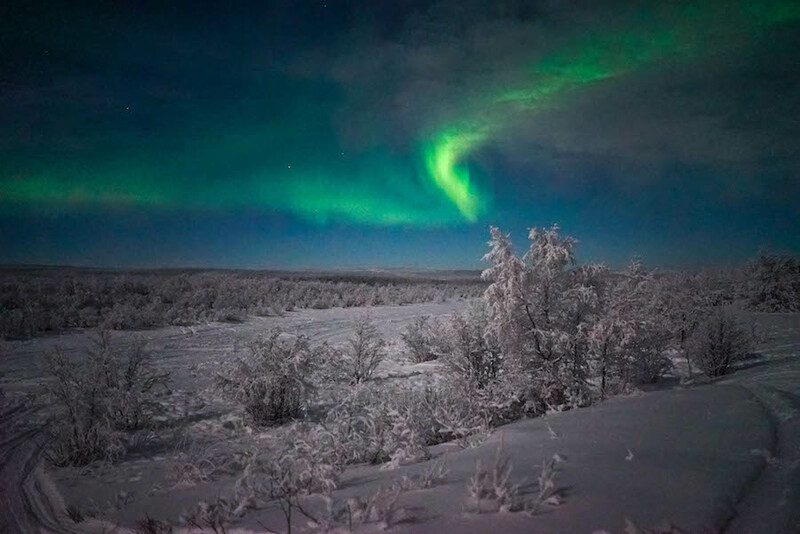 That night, upon returning from the goahti, we were lucky enough to see what has been call the crème de la crème of the arctic—the Northern Lights. For fifteen minutes they danced and twisted in the sky. The grand finale. Though I didn’t capture the Northern Lights, the talented girls I was with got some spectacular shots of this phenomenon. 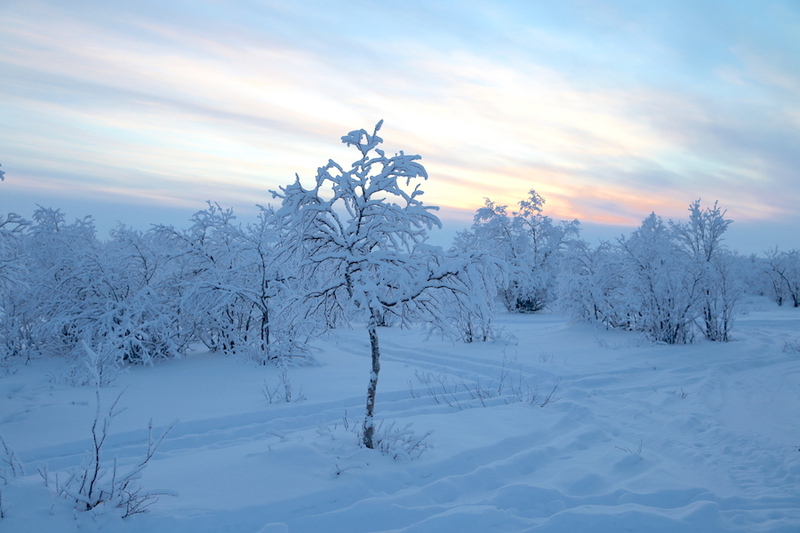 Although short and sweet, my trip to Finnmark was simply magical. I learned the peace that nature and wildlife brings, I learned the importance of preserving family traditions and culture, I bonded with animals and the land on a genuine level, and experienced an area of the unspoiled Arctic that many people do not have the opportunity to visit. 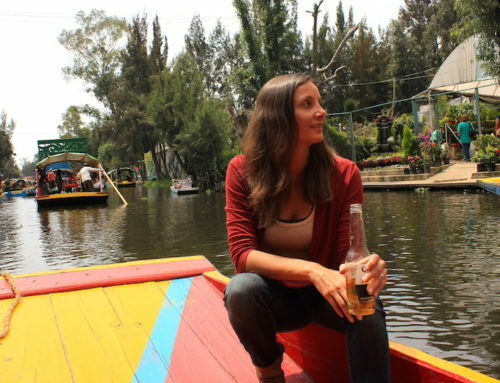 If you want to learn more about making an impact through travel and sustainability, visit Impact Travel Alliance who are committed to improving our world through tourism. Getting There: You can book a flight into Alta from many major US cities with Norwegian Air, which—by the way—was named the most fuel-efficient transatlantic flight! For a special treat book a seat in Premium Class, it combines budget prices with first class service and amenities. I almost had too much leg room (is that even possible?) and the reclining chair with retractable foot rest made sleeping easy peasy (which is never the case for me in economy)! Plus, I felt very fancy to be served a drink prior to taking off. But, the BEST part was no jet lag—zilch…nada…none—because their new energy efficient planes are designed for less cabin pressure which equals less jet lag. NOTE: The flight from Alta to Oslo is approximately two hours. You may choose to fly directly to Oslo, spend a few days exploring there (you’ll have a layover there anyway when flying to Alta from the US) and then pop on a quick Norwegian Air flight to Alta from there. Getting from the airport to the Oslo city center is easy-peasy on the Flytoget high-speed train. It leaves right from the airport (follow the signs) and takes about twenty minutes. Where to Stay: In Alta , you are probably going to want to stay at least a night before and/or after heading deep into the Arctic tundra. A great choice is Thon Hotel Alta, that is situated right in the center of town. 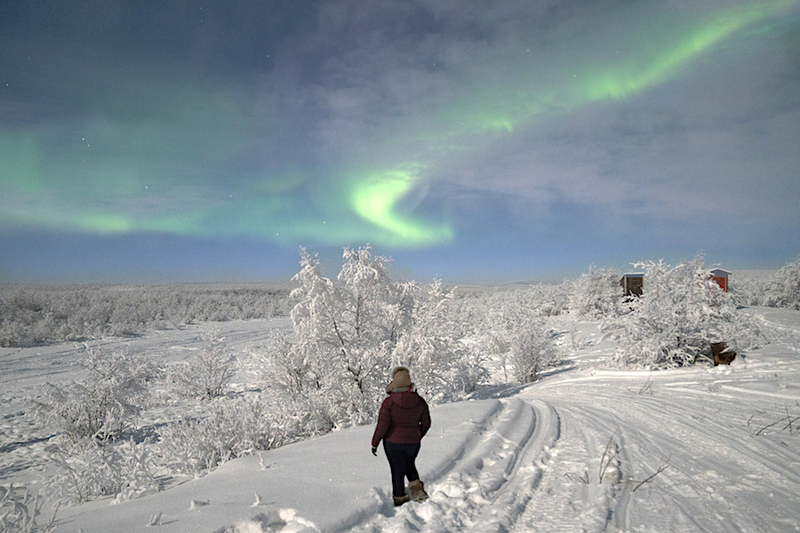 They have cozy rooms that overlook the beautiful Northern Lights Cathedral, and their restaurant has many tasty options from arctic char to reindeer filet. If you choose to spend time in Oslo (and you should!) the sustainably conscious hotel choice would be Scandic Vulkan, which is in the center of the trendy Vulcan area where there are dozens of restaurants and the Mathallen food hall right next door. But definitely don’t miss breakfast at the hotel, it is one of the best I’ve ever had. Or search some great deals on hotels of your choice at Booking.com. If you’re looking for more of a home atmosphere (or are traveling with a group of people), head over to Airbnb that has houses, apartments and even just a room for rent in every price range. 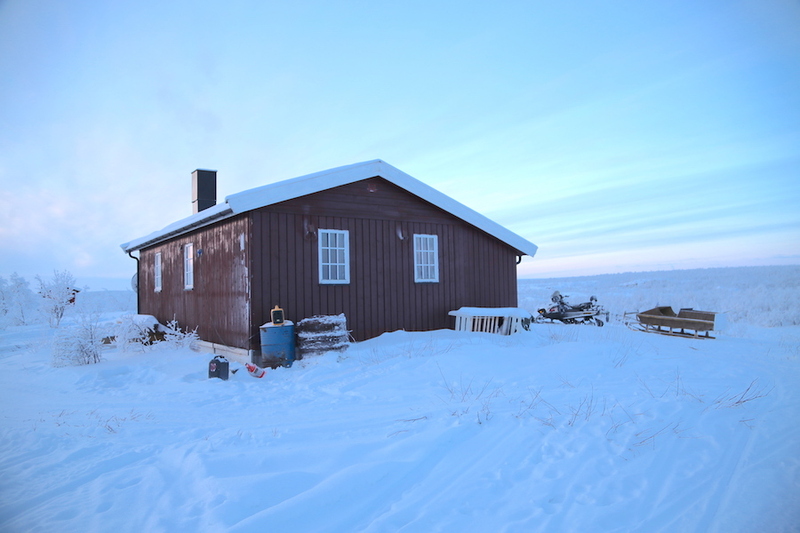 Booking with Visit Natives: You can wake up with a Sámi family in the Arctic tundra (or with the Maasai in an African savannah) by booking with Visit Natives who specialize in these unique homestays. The experiences provided by About Natives are authentic and immersive. There are no planned tours or strict itineraries, it is about real-life experiences with unique indigenous people. Their aim is to promote sustainable travel where nature and the local people are respected. Insurance: It’s always a good idea to travel fully insured so you are protected in case of trip cancellations or medical emergencies. You can check out pricing are Travelex Insurance. 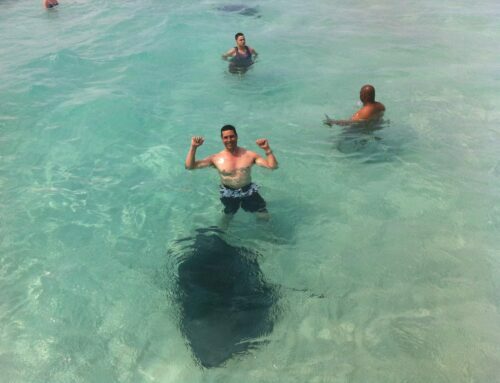 What an incredible experience! To see the Northern Lights would be amazing. 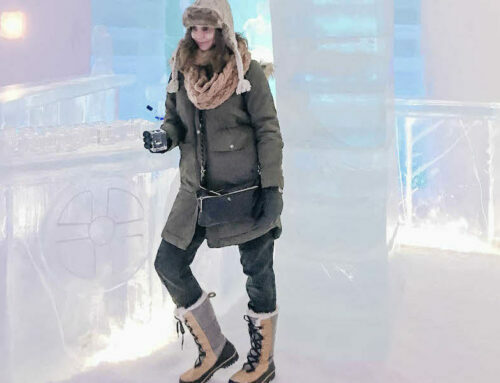 The whole experience was incredibly memorable and the Northern Lights were the cherry on top! 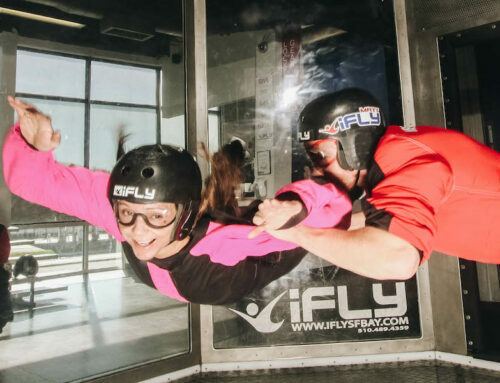 What a wonderful and amazing experience that i also love to try. 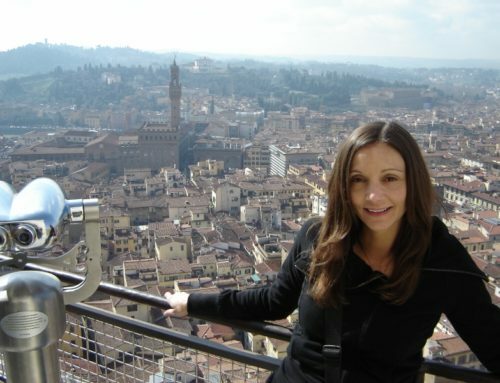 Annette, is it easy to book for a home-stay? Is it available all year round? Yes, it is very easy to book and is available in all seasons. You can book through Visit Natives.